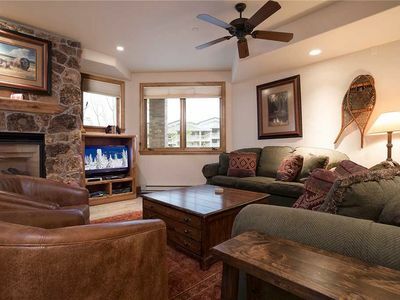 The Rocky Mountains are calling from this modern 4-bedroom, 3.5-bathroom vacation rental condo in Steamboat Springs! 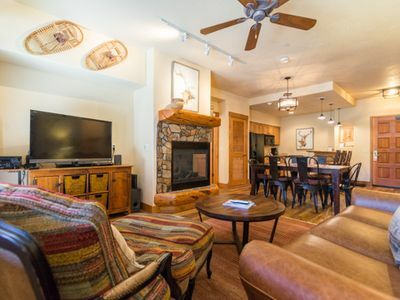 This 1,800-square-foot tri-level condo comfortably sleeps 8 and boasts sleek mountain-themed décor, hardwood and tile flooring, a fireplace, and an expansive side deck with a gas grill and dining area. 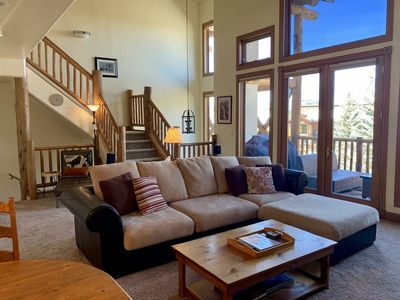 Mountain bike or ski at the Steamboat Springs Resort, take a soothing dip in the Strawberry Park Hot Springs, or create an adventure of your own at this chic mountain retreat! 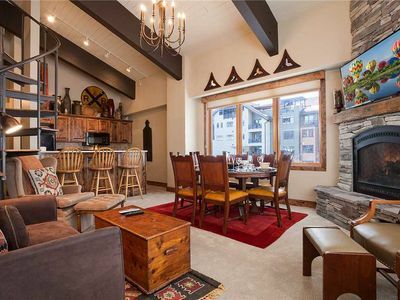 Located just 5 minutes from the main Steamboat Gondola, this recently renovated condo has everything you need for a memorable trip to the mountains. 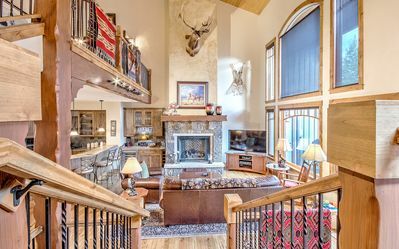 Boasting a polished white interior, 1,800 square feet of beautifully adorned living space, and stunning views of the Yampa Valley area, it's hard to picture a better Rocky Mountain home-away-from-home. 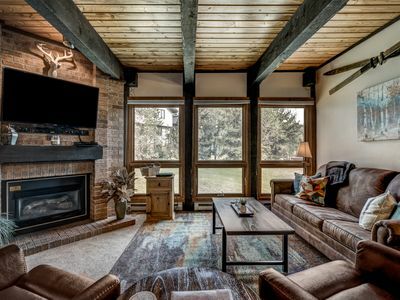 Kick your shoes off, store your ski gear in the mudroom and head upstairs to the rustic living room filled with top-of-the-line furnishings. 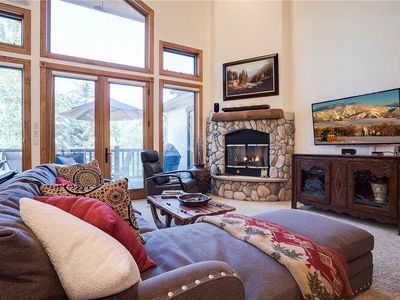 From the wagon wheel spoke on the wall to the stone-surrounded fireplace, you'll instantly fall in love with this condo's modern mountain-themed design! 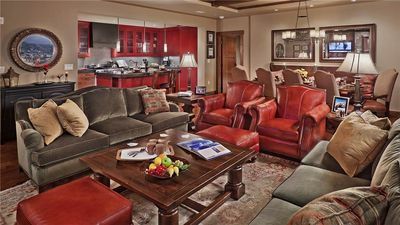 Relax on one of the 2 comfortable armchairs in the living room while the chef of the group showcases his Iron Chef skills in the kitchen. Outfitted with stainless steel appliances, expansive countertops, clean white cabinetry, and plenty of spices, even the most discerning chefs will enjoy their meal preparation. 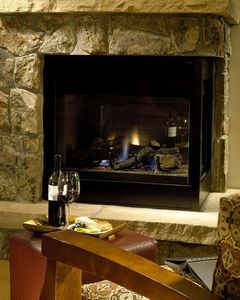 After an activity-filled day on the slopes, reward yourself with a refreshing cocktail on the private wooden deck. 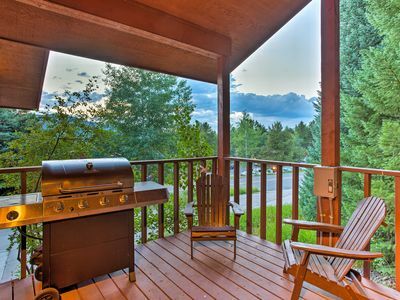 Gaze out at the jaw-dropping mountain views through the Aspen Trees while you wait for your dinner to finish on the gas grill! Finish off the night by stargazing from the deck or walk back inside to watch a movie on the flat-screen cable TV in the living room! When it's time to hit the sack, retreat to one of the 4 comfortably furnished bedrooms each with ample closet space and en-suite bathrooms. 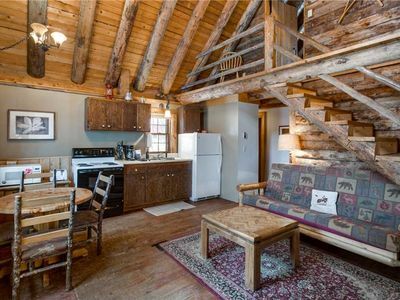 The kids tend to gravitate towards the first-floor bunk room while adults love the third story master or guest room. 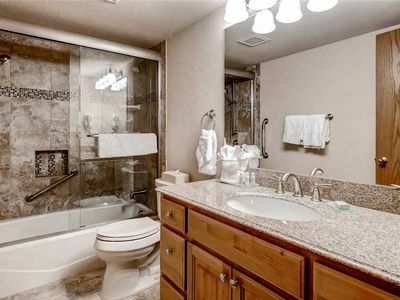 Please note that this unit has a strict max occupancy of 8, however, an air mattress and Pack 'N Play are available within the condo. Locals flock to Steamboat Ski Resort when the snow starts to fall in the Rocky Mountains. 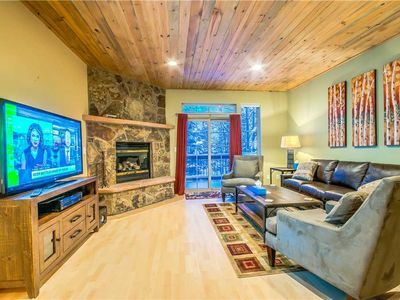 This condo has a free ski bus pick-up and drop-off spot located at the bottom of the driveway, or you can make the quick 10-minute walk! The shuttle also provides a 10-minute ride to downtown for those looking to shop and explore. This area offers so many attractions and events that the town puts on all year round. The Fourth of July is always a fun time to visit for the parade! The possibilities are endless with what you can do in Steamboat, but a couple of ideas include skiing, biking, hiking, running trails, festivals in town, visiting the farmers' markets, fishing, and tubing down the Yampa River. 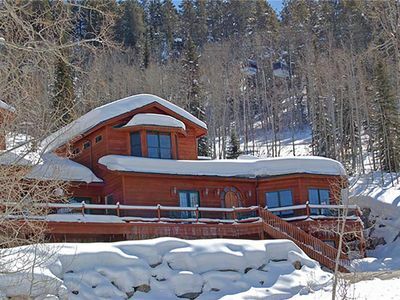 Steamboat is well known for its hot springs and probably its most popular spot is in the Strawberry Park Natural Hot Spring just 25 minutes away. Some other recommendations are the Old Town Hot Springs and the Sulphur Cave Spring. When you're not cooking at the condo, be sure to hop on the downtown shuttle to enjoy a meal downtown! Some local hotspots are Laundry, O'Neil's Tavern & Grill, Back Door Grill, Mahogany Ridge Brewery & Grill, Table 79 Foodbar, and Aurum Food & Wine among many more! No matter what activity you decide on, you really can't go wrong in this top-notch mountain town! 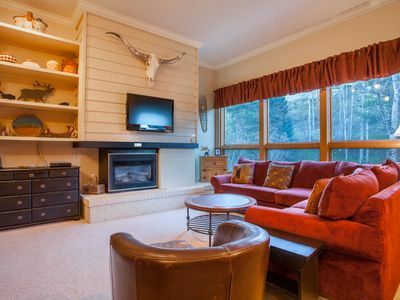 - Amenities include a fully equipped kitchen with stainless steel appliances, modern décor, 3 flat-screen cable TVs, a private deck with an outdoor dining area, gas grill, and mountain views, stone-surrounded fireplace, a mudroom with a storage closet, free WiFi, in-unit laundry machines, and more! 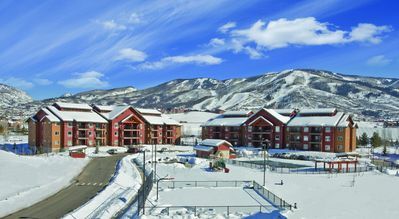 - Fantastic Steamboat Springs Location - Steps from the free shuttle to the mountain, downtown, and more, a 25-minute drive from Strawberry Park Natural Hot Spring, 10 minutes walking distance from the slopes, near hiking, fishing, farmers' markets, hot springs, biking, tubing, canoeing, and so much more! 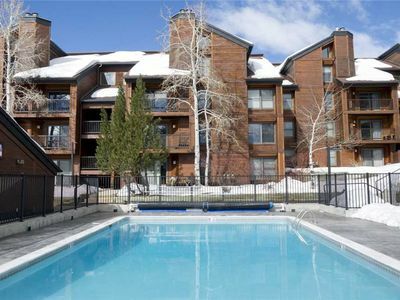 Beautiful 2 Bedroom Mtn Condo, Resort Amenities, Great Staff! 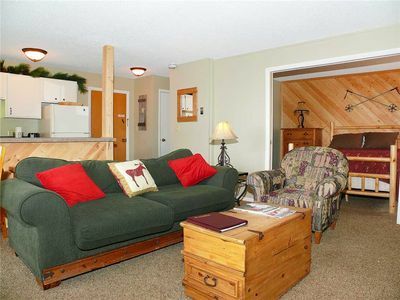 Awesome Summer Rates - Rustic And Private Cabin! 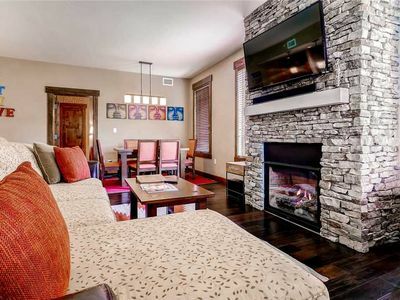 Fantastic Summer Rates - Spacious Townhome With Garage! 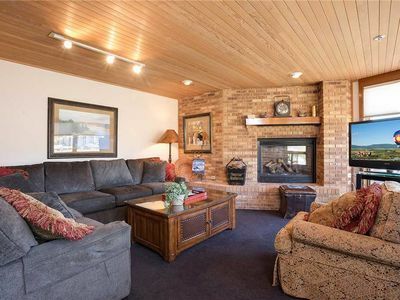 New Owners, Great Rates! 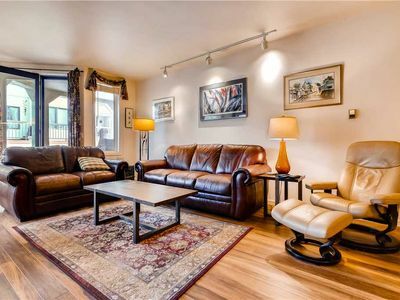 Spacious, Well Appointed Townhome in Ideal SS Location!